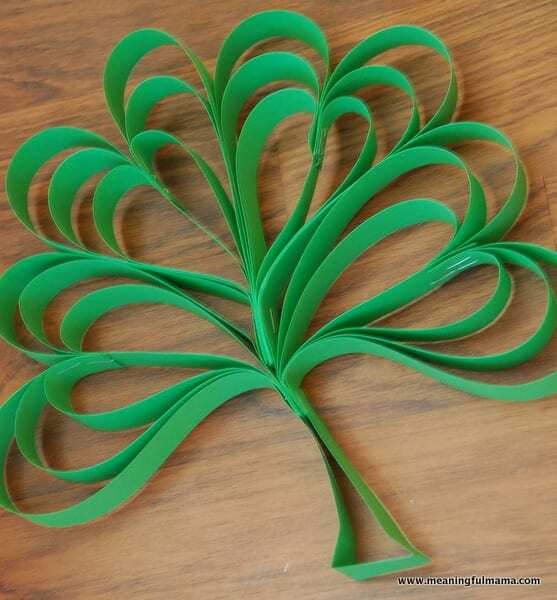 With St. Patrick’s Day approaching, moms and teachers are searching for the four leaf clover paper craft ideas. These beautiful clovers are fun to hang in homes or classrooms. 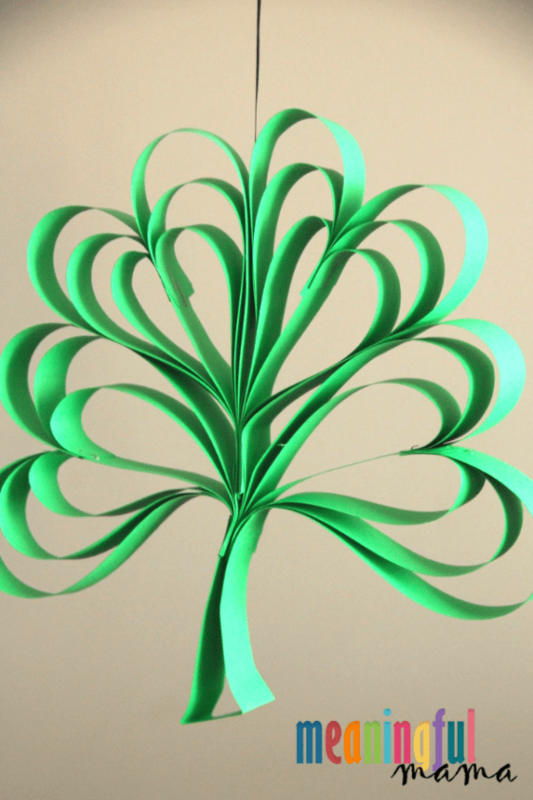 I do have a more simple four leaf clover paper craft if you are looking for something that uses less materials or takes less time. 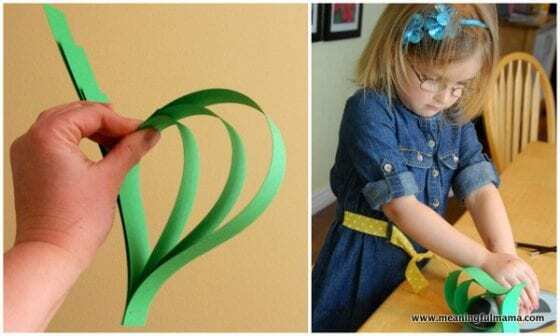 These are perfect St. Patrick’s Day crafts for kids. 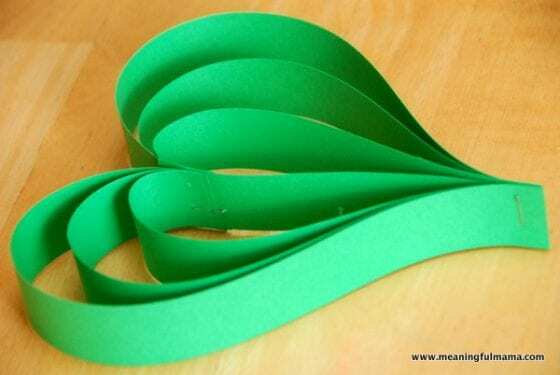 This Four Leaf Clover Paper Craft was inspired by my paper pumpkin craft. I simply adapted it for St. Patrick’s Day. This craft was done with my kids when they were littler. 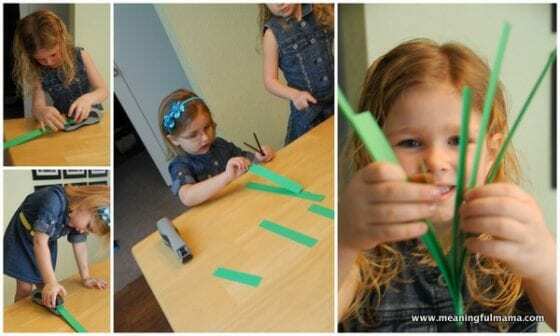 I had helpers ranging from 3-7, so assisted, it’s a fun craft for even toddlers. 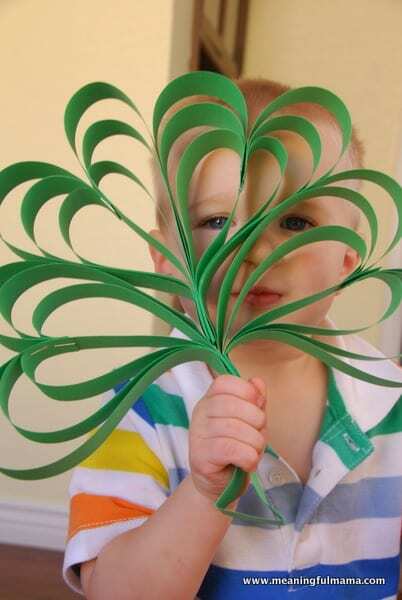 It would also be fun for any preschool or kindergarten craft. Using a safe paper cutter, cut 1 inch strips. You will need to cut (2) 11″, (2) 9″, (2) 7″ and (1) 5″ for each leaf, so if you are making a four leaf clover you will need 4 times that amount – i.e. (8) 11″, (8) 9″, (8) 7″ and (4) 5″. 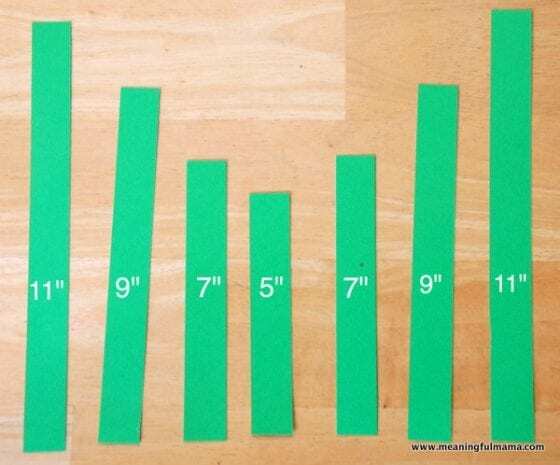 Have the kids stack the strips of construction paper in the following order: 11″, 9″, 7″, 5″, 7″, 9″, 11″. The bottoms will need to line up. Staple the bottom together. This is a thick amount of papers, so the kids might need help with the pressure needed. At this point you have varying lengths at the top. The next step is to take one of the sides (one set of 11″, 9″ and 7″ strips) and line up the top end. This will bow one side of the clover out a varying lengths as pictured on the above left. 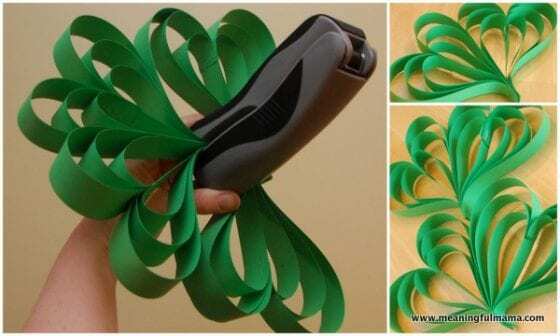 Bend these around around, sandwiching them to the 5″ strip, and staple them together. Do the same with the other side. Above you see the results, and you have officially accomplished one leaf of the clover. Now press forward to make the other 3 leaves. Once you have all four leaves made, staple them together in the shape of a four leaf clover. You will staple two together at the base. Then staple the other two together at the base. Slide one set into the other and staple again. Cut one final 1″ strip at 11″, shape it into a clover stem, trim to size and staple it at the base. There you have it. 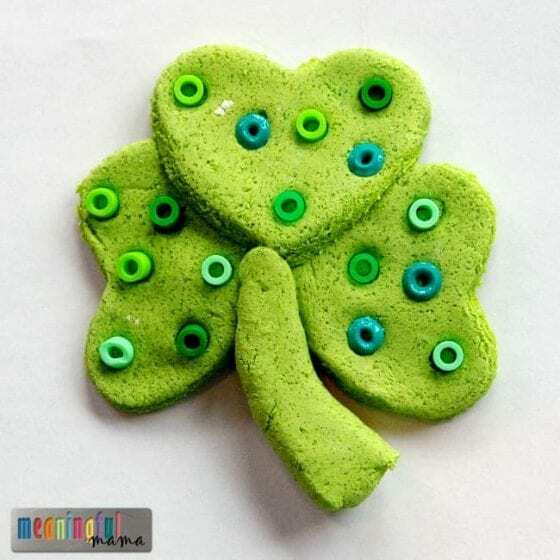 Your four leaf paper clover craft is complete. To enjoy this season, attach it to a string, and hang from the widow or ceiling. 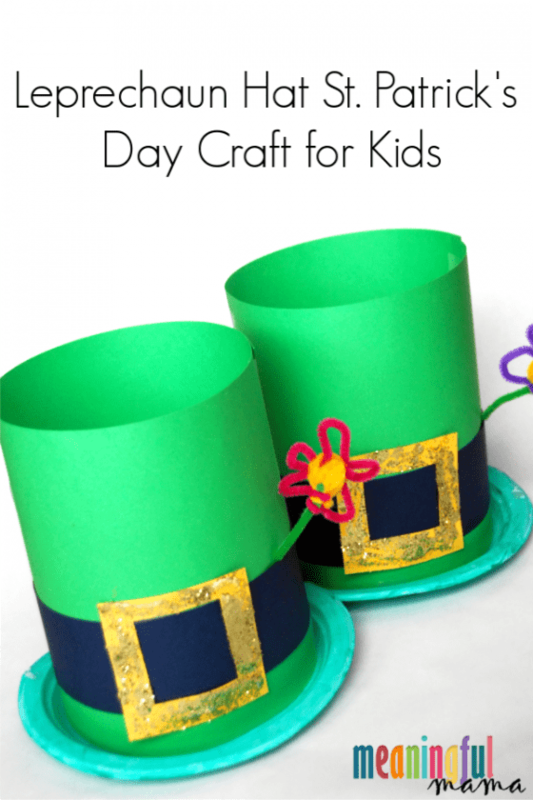 Looking for Other Great St. Patrick’s Day Crafts to Do with Your Kids? Note: This post was originally written in 2013, but it has been updated for quality in March of 2019.